Patagonia is mythical. Distant, far away, enormous, cold and sometimes particularly solitary. Usually when you think of Patagonia in mind two images are cast: the imposing and majestic Perito Moreno, and then the cute penguins, which, given the perpetually low temperatures, even in summer, in the months from August to March come in this region of world to reproduce and, therefore, can be observed not only in large quantities but also in different species. On the last trip to Argentina made, which I mainly dedicated to Patagonia, no longer being a whale in the Peninsula de Valdes, which runs from September to November, it did not make much sense to get up to Punta Tombo, despite the colony of Greater Magellan penguins of Argentina. I, therefore, considered a series of alternative stages that could show me the penguins, from Magellan but not only, devoting a few days to tours and excursions starting from Tierra del Fuego, both from Ushuaia and from Punta Arenas (in Chile). This is the main place to see penguins when traveling in Argentina. However, due to long distances, the detour to Puerto Madryn is generally recommended during the whale watching season, which is concentrated between September and ends in November. Every year from September to March in Punta Tombo more than 1.5 million penguins come here to reproduce. The Punta Tombo penguin colony is located within a nature reserve that can be reached by car from Trelew (110 km), Rawson (110 km) or Puerto Madryn (175 km), or with daily excursion. The one-way trip takes about 2 hours on a dirt road. This colony is perfect to visit in conjunction with whale watching (between September and late November). 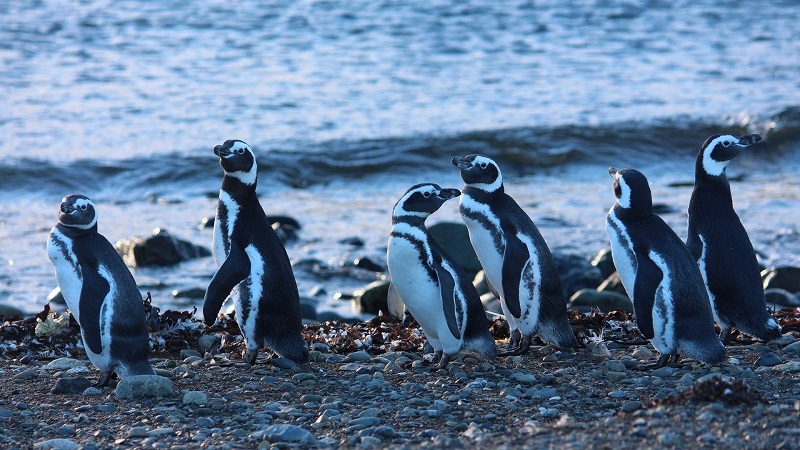 A valid alternative for those who do not want to leave Patagonia without seeing the penguins but do not have time to go to Puerto Madryn, is the excursion to Isla Martillo, departing from Ushuaia. This tour that I found very pleasant, combines the island with the navigation along the Beagle channel and a section of National Road No. 3. There are about 1000 penguin nests in Isla Martillo, but it also hosts a small penguin colony Papua (common Pygoscelis), the only one in all of South America, and at the time of my visit also two royal penguins! On the island, it is possible to walk along the track but very close to the penguins. Besides the visit to the island, where it is possible to stay no more than an hour, the tour also includes some time at Estancia Harberton and a visit to the Museum of mammals and seabirds, small but very interesting. On the way back we pass the island of cormorants and sea lions to return to Ushuaia in the afternoon. Check This Out: Where to See Whales in Costa Rica? 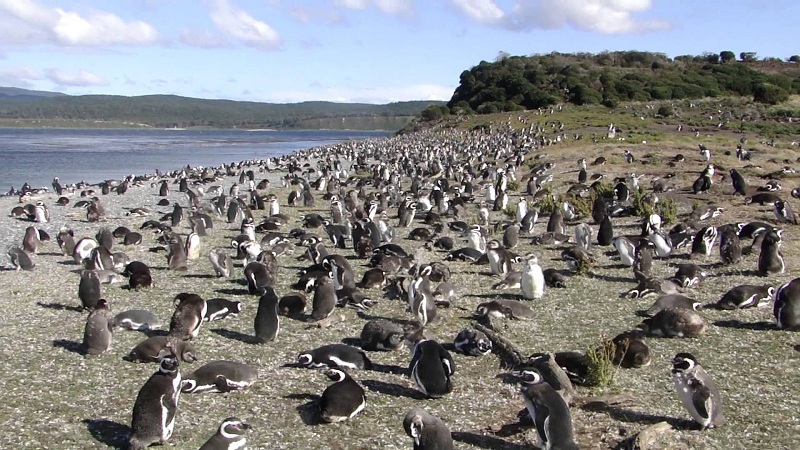 In this small island not far from Punta Arenas there is a small but wonderful island inhabited by thousands of Magellanic penguins, and when I say thousands I mean it! The island can only be accessed through a half-day tour or with Australis cruise. After reaching the pier with the boats to the island with a boat you reach the Natural Monument Los Pingüinos, a protected natural area formed by the island of Marta, where colonies of sea lions live, and from the Island of Magdalena where during the period from October to April also 170,000 meet on this island to reproduce. We will not be close to the Antarctic imperial penguins. The penguin Rei National park, in the island of Tierra del Fuego, protects about 50 royal penguins that have been living in this part of the Chilean Tierra del Fuego for years. The journey through the Patagonic Pampa is very long, the penguins are seen from very far as they have been built barriers just to let them live undisturbed, but see these wonderful and elegant animals. Since the journey to reach the protected area is very long, the tour, which lasts about 13 hours, includes different stops including the Cerro Sombrero field, where the oil was discovered, and Primera Angostura from which we will embark on the ferry, where fortunately you can see the dolphins (I was lucky), with which you cross the Strait of Magellan on the way back to Punta Arenas, passing for Estancia San Gregorio, whose structures, dated 1878, are today abandoned. Which is the best season to see the Penguins in Patagonia? The Penguins begin to arrive along the coast of Patagonia in September when they come to reproduce and remain there until about mid-March. The best time to see them is the months of December and January when you can spot the small hairy chicks that they eat from the nests. We Choose A Suitcase Or A Travel Bag. Where to See Whales in Costa Rica?